from Tellers of Weird Tales! 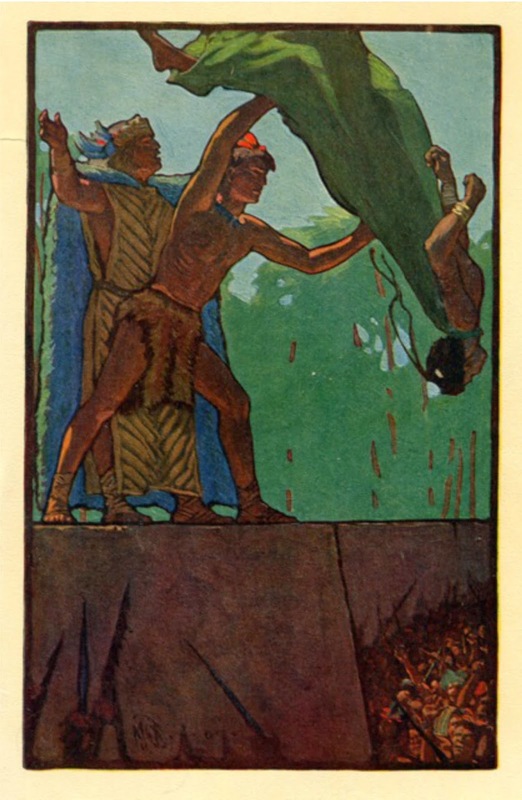 For Thanksgiving, here's an illustration from Weird Tales by Andrew Brosnatch. 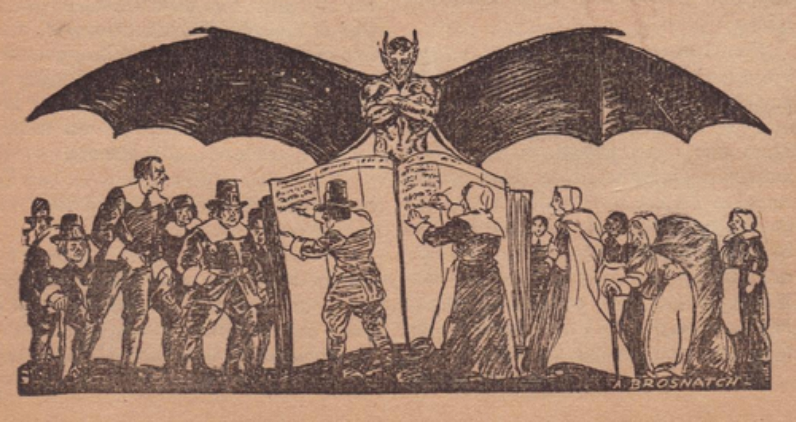 It looks like it could be for "Young Goodman Brown" by Nathaniel Hawthorne, but according to my index of the magazine, Hawthorne's story (from May 1927) was not accompanied by an illustration. 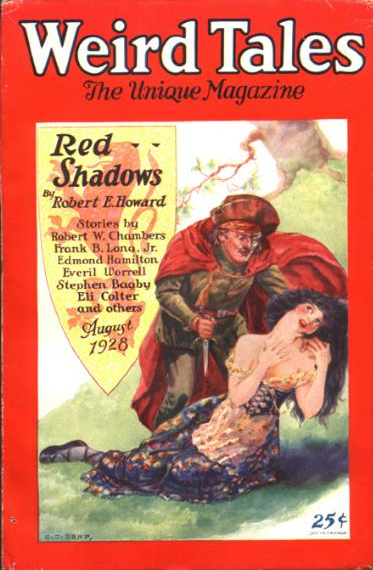 This cover, from August 1928, illustrates Robert E. Howard's story "Red Shadows" and depicts a colorfully dressed Puritan in the person of Solomon Kane. No dour black broadcloth for him. The art is by C.C. Senf. Died June 4, 1906, Isle of Man? Poor George Griffith. If it hadn't been for H.G. Wells (and Griffith's own native prejudice), his might be a household name today. In the nineteenth century, before science fiction came into existence as a coherent genre, Griffith wrote prolifically about future war, anticipating aerial warfare, missiles, radar, sonar, nuclear weapons, world dominance by multinational cartels, and the rise and fall of powerful states. Even after his work had been eclipsed by that of H.G. Wells, Griffith created imaginative tales of immortality, parallel worlds, lost worlds, spaceflight, multiple dimensions, and psychic powers. Unfortunately, he held the United States in disdain and his stories were not widely published in this country. Readers in Great Britain may know him still. In the United States, H.G. Wells is the author of nineteenth-century British science fiction. There's a lesson in that for writers everywhere: don't look down on your readers. George Chetwynd Griffith-Jones (1) was born on August 20, 1857, in Plymouth, England. Son of a vicar, he worked various jobs until arriving on the staff of Pearson's Magazine as a clerk. He was by then in his thirties (presumably) and had written several minor works, but the story he proposed to the editor of the magazine was of an altogether different type. We should remember that the nineteenth century was an era of industrialization and mass movements. Those two developments were combined in tales of marvel created by Jules Verne (1828-1905) and in a new kind of tale, the future-war story, pioneered in The Battle of Dorking by George Chesney (1871). George Griffith's proposal was for the future-war story that would make his name. 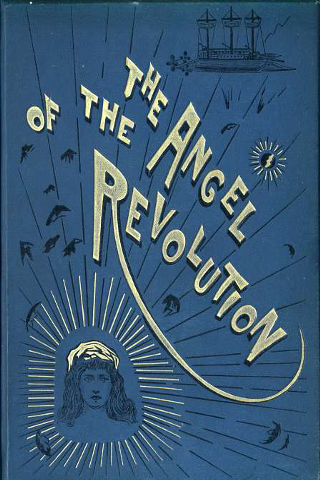 In short order, with Pearson's publication of The Angel of the Revolution (1893), Griffith rose from anonymous clerk to acclaimed author. The Encyclopedia of Science Fiction calls George Griffith "one of the most influential sf writers of his time." Sam Moskowitz--apparently without a sense of irony--described him as "undeniably the most popular science fiction writer in England between 1893 and 1895." That's a very brief period indeed. Even after H.G. Wells (1866-1946) trumped Griffith's success with his own future-war novel, The War of the Worlds (1898), Griffith continued writing tales of nascent science fiction. His works before and after that date include: Olga Romanoff (a sequel to The Angel of the Revolution, 1894), The Outlaws of the Air (1895), Valdar the Oft-Born (1895), The Great Pirate Syndicate (1898), Honeymoon in Space (1900), The World Masters (1903), The Stolen Submarine (1904), and The Great Weather Syndicate (1906). The list could go on and on, for George Griffith was an amazingly prolific writer. Many of his novels were first serialized in Pearson's, then printed in hardback. 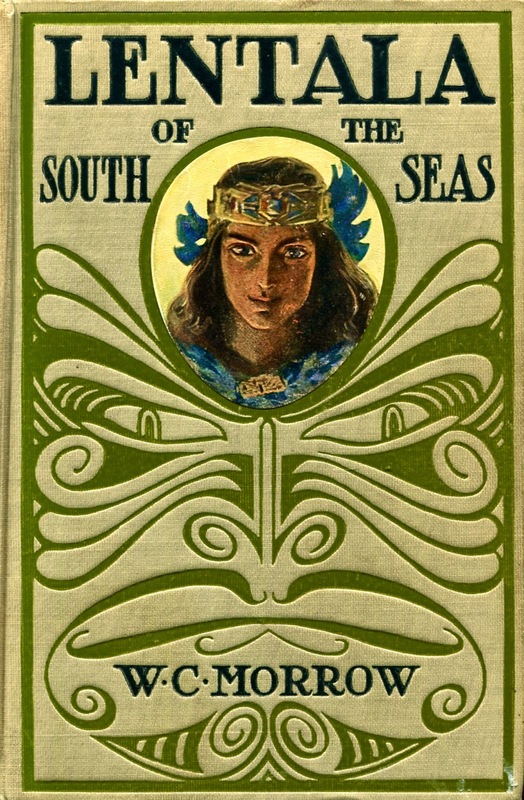 Even after his death in 1906, his works continued to roll off the presses: The World Peril of 1910 (1907), The Destined Maid (1908), The Sacred Skull (1908), and The Lord of Labour (1911). 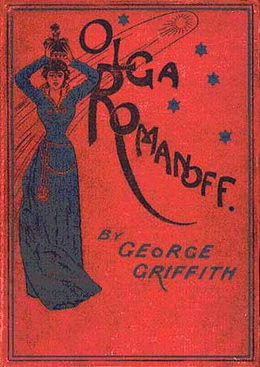 George Griffith was the science fiction author H.G. Wells regarded as the personification of a popular success and whose influence Wells acknowledged within the context of his stories. [T]he difference between Griffith's interplanetary novel [Honeymoon in Space] and the first American space opera classic, E.E. Smith's The Skylark of Space (1928), is mostly one of scale, and the numerous space opera tales following this novel are certainly much in debt to Griffith . . . .
Griffith's epic fantasies of romantic communists in a future world of war, dominated by airship battle fleets, and grandiose engineering provided a template for steampunk novels a century before the term was coined. (1) Griffith's middle name is also sometimes spelled--I believe incorrectly--as Chetwyn. (2) I'm not an expert on steampunk, but I'm pretty sure it has been stripped of any political content. Science fiction fans may have an imagination, but even they can't envision a world in which communism is somehow a functioning system. That goes beyond the Utopian and into the realm of the delusional. (3) Eighteen ninety-three was also the year of the World's Columbian Exposition, commemorating the 500th anniversary of Columbus' discovery of America. Although that world's fair took place in Chicago, a place Griffith would have disliked as he disliked the rest of this country, demonstrations of electrical power and the debut of the Ferris wheel must have impressed forward-looking men like him. Also, Griffith and his compeers wrote primarily of airships rather than of airplanes. The books and magazines in which their stories appeared were illustrated. In other words, images of airships were on people's minds in the mid-1890s. It should come as no surprise that there would be sightings of supposedly real airships in 1896 and 1897 in the United States. The same phenomenon occurred half a century later with the first flying saucer sightings. For years prior to 1947, science fiction magazines had printed images of saucer-shaped spacecraft. Before they could be seen, flying saucers had to be imagined. Artists and writers did the imagining, just as they had done in the late 1800s. Sam Moskowitz launched Weird Tales in 1973 with a fiftieth anniversary issue full of previously printed stories and art. Few if any of the illustrations inside were created specifically for the new magazine. Most look like recycled images from the original run of Weird Tales or other pulp magazines, probably used without permission of the artist or the publisher. By my count, there are ten illustrations inside, including the main title heading on the first page. Of those ten, four are by Virgil Finlay. The rest are unsigned. The second issue includes eleven illustrations, plus a two-page feature on the art of Virgil Finlay. The main title heading and the heading for "The Eyrie" (the letters column) are original to the first incarnation of Weird Tales. Andrew Brosnatch created the drawing for "The Eyrie" in 1924. That drawing ran in Weird Tales until 1954 and in three of the four issues from 1973-1974. Some of the illustrations from this second issue look like they could have been new to Sam Moskowitz's Weird Tales. All but one are unsigned. The only signed piece of art is an illustration with the initials "S.P." Finally, with the third issue, there is new art signed by the artist. There are nine drawings in this issue, four of which are by Don Rico, a veteran comic book artist, illustrator, and writer. There are also three unsigned illustrations, plus the main title heading and the heading for "The Eyrie" by Andrew Brosnatch. If the third issue was the Don Rico issue, the fourth was the Geoffrey Sickler issue. Of the eleven illustrations in this issue, at least four are by Mr. Sickler. Five others, plus the main title heading and the letters column heading, are unsigned. The last illustration to appear in Sam Moskowitz's Weird Tales was Andrew Brosnatch's heading for "The Eyrie." Coincidentally, 1974 was the fiftieth anniversary year of the first use of Brosnatch's drawing. 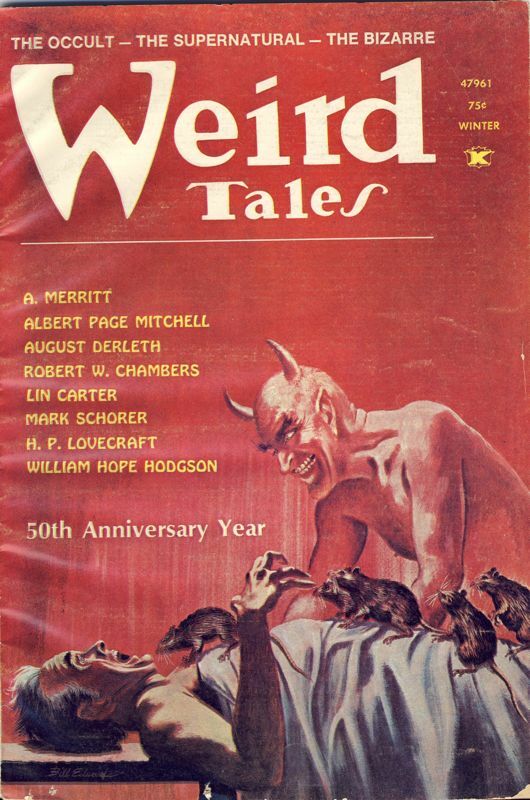 Finlay had of course contributed to Weird Tales during its first run. S.P. is an unknown artist. That leaves just two names to add to the list of interior artists in Weird Tales. I'll write about them separately in weeks to come. An illustration for the story "The Utmost Abomination" by Clark Ashton Smith and Lin Carter from the second issue of Weird Tales, Fall 1973. The art is initialed in the lower right corner, but S.P. is an unknown artist to me. 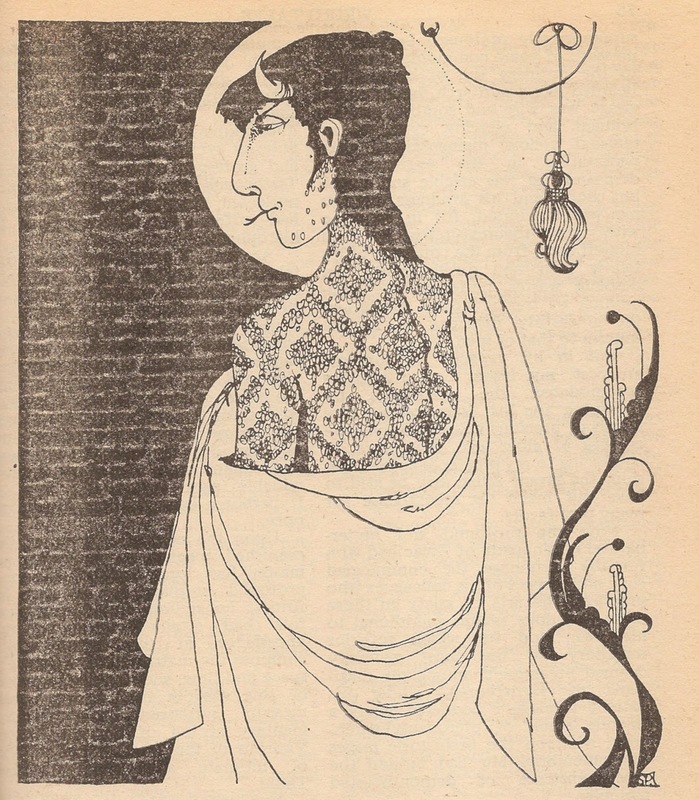 It's safe to assume that he or she was familiar with the work of Aubrey Beardsley and perhaps also Harry Clarke. Weird Tales, the magazine that never dies, came back to life again in 1973 under the editorship of Sam Moskowitz. Unfortunately, that incarnation was short-lived with a run of only four issues. The cover of the first issue was created by Virgil Finlay in the 1930s but had never before been published. As we have seen, the cover for the last issue was created by Jack L. Thurston. Thurston's cover was for an unrelated paperback book and was probably swiped and altered by an unknown artist. That leaves just two covers that would seem to have been created specifically for the 1970s version of Weird Tales. Of those two covers, only one--issue number three--was signed by the artist. His name was Bill Edwards and he lived a long and colorful life. Born in New Jersey on September 14, 1918, Edwards started drawing horses as a youngster. He grew up on a ranch in Wyoming and learned to be a rodeo rider. A few broken bones brought an end to that career and the art world was better for it. 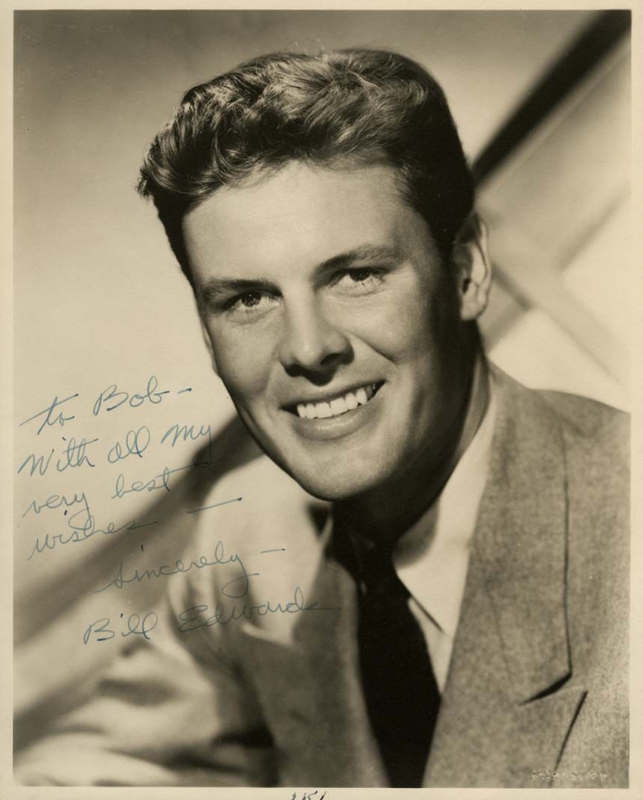 Six feet five inches tall with dark blond hair, blue eyes, and boyish good looks, Bill Edwards became a model in New York City and an actor in Hollywood. Beginning with Strange Faces in 1938, Edwards played bit parts and supporting roles in movies and television for the next half century. His credits included Yankee Doodle Dandy (1942), Hail the Conquering the Hero (1944), and Tora! Tora! Tora! (1970), plus television roles in Bonanza, Hawaii Five-O, and Magnum, P.I. During the 1960s, he ran a SCUBA shop in Reseda, California, and helped establish a diving club, the International Diving Society. 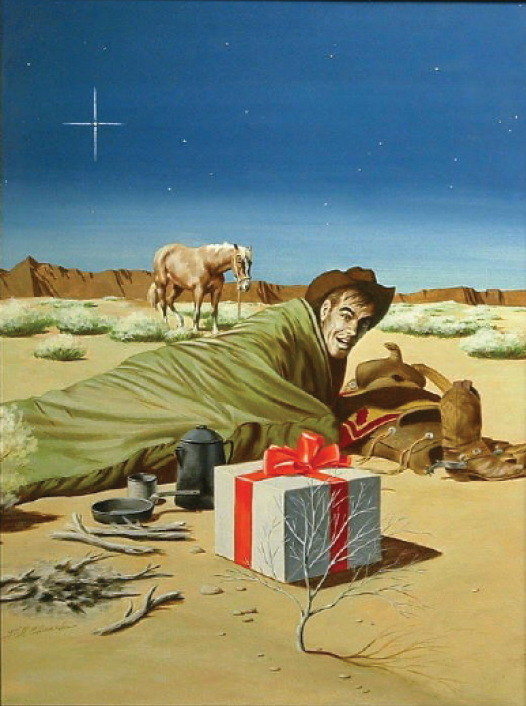 Edwards' art career began in the 1950s with illustrations for paperback books and men's magazines. He also created illustrations of paper dolls. Edwards is perhaps best known for his work for the "exploitation" market, showing women in various states of undress and often in peril. His lone cover for Weird Tales came in the Winter issue of 1973. Edwards' last acting credit (according to the Internet Movie Database) came in 1987. He died twelve years later in Newport Beach, California, at age eighty-one. Model, actor, and artist Bill Edwards, one of several contributors to Weird Tales to have worked in show business. Others included Mindret Lord, Trevor Bardette (Terva Gaston Hubbard), and Duke Hickey (Preston Langley Hickey). Edwards got his start as a rodeo rider and knew horses and Western scenery well. 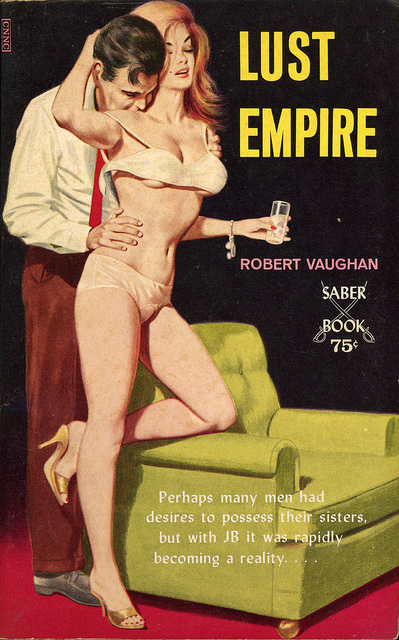 He is most well known today for his "exploitation" paperback covers. Say what you will about the subject matter--Bill Edwards knew how to draw. There's probably no need in pointing out the symbolism in a white bedpost or a pink curtain. 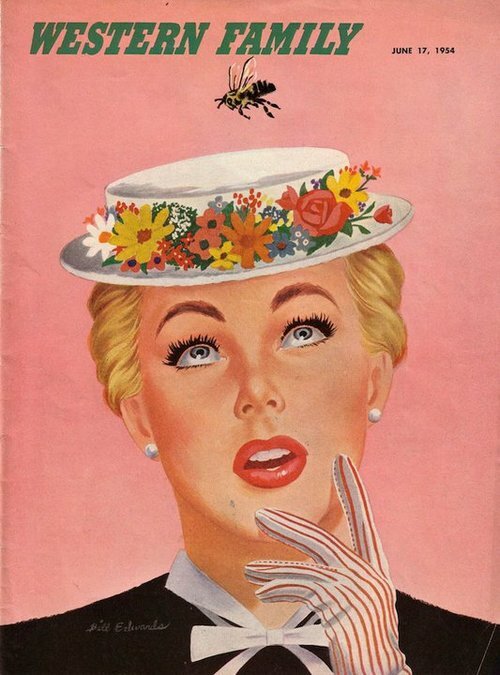 Here's an early magazine cover where the color pink is used a little more innocently. Finally, Bill Edwards' lone cover for Weird Tales. In contrast with Casanova above, the man in this picture, lying prone and covered with a sheet, has little to look forward to. San Francisco must have been crawling with writers in the late nineteenth and early twentieth centuries. Many wrote stories of strange and supernatural events. Others are known to students of mainstream literature. Chief among them were Ambrose Bierce (1842-? ), Bret Harte (1836-1902), Frank Norris (1870-1902), and Jack London (1876-1916). Others included Joaquin Miller (1837-1913), Charles Warren Stoddard (1843-1909), Edwin Markham (1852-1940), Gelett Burgess (1866-1951), and of course Emma Frances Dawson (ca. 1839-1926), about whom I wrote a few days ago. The list could go on and on, but if you go too much further, you will have to include W.C. Morrow, a teller of weird tales with a reputation out of proportion to his literary output. William Chambers Morrow was born on July 7, 1854, in Selma, Alabama, son of a slaveholder. The Civil War and Reconstruction put an end to that of course. In 1870, when the census enumerator found them, Morrow's father and mother were keeping a hotel with their sixteen-year-old son in residence. Morrow graduated from Howard College (now Samford University) at age fifteen and moved to California in 1879. There he submitted stories to The Argonaut and the San Francisco Examiner. Morrow's first book, Blood-Money, was published in 1882. 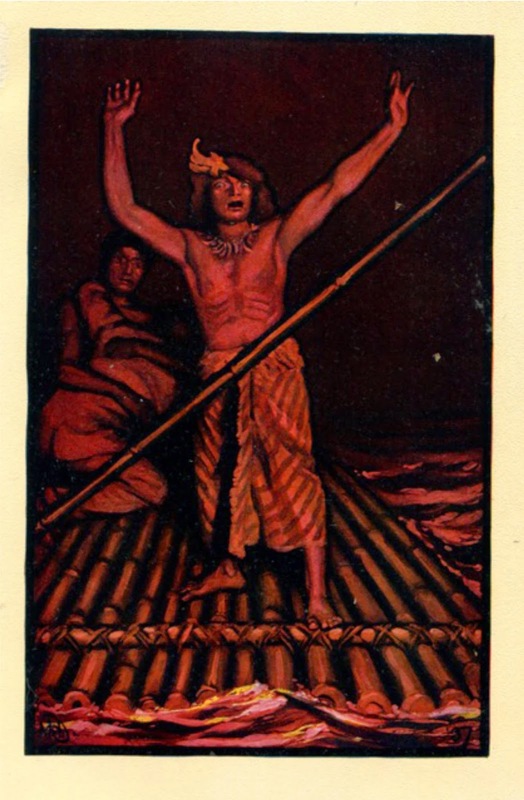 His other works included A Strange Confession (newspaper serial, 1880-1881), The Ape, the Idiot and Other People (1897), The Art of Writing for Publication (pamphlet, 1899), A Man; His Mark: A Romance (1900), Lentala of the South Seas (1908), and Over an Absinthe Bottle (pamphlet, 1936). I suspect Bierce would have appreciated the off-kilter and slightly cynical titles. Morrow, purely on the basis of the stories in The Ape, The Idiot and Other People, ranks with Poe, Hawthorne, Bierce, Chambers, and Crawford as one of the truly great American masters of the horror story. Charles Caldwell Dobie claimed Morrow as "a master of the imagination, properly controlled by a lucid style." Weird Tales reprinted several of Morrow's stories, four during the Farnsworth Wright era and one in Moskowitz's version of 1973-1974. The editor Wright was also a San Franciscan. I wonder if he could have known the men and women who helped make his home city a literary hub. Morrow's stories have also been anthologized in Argonaut Stories (1906), 33 Sardonics (1946), and Horror Times Ten (1967). 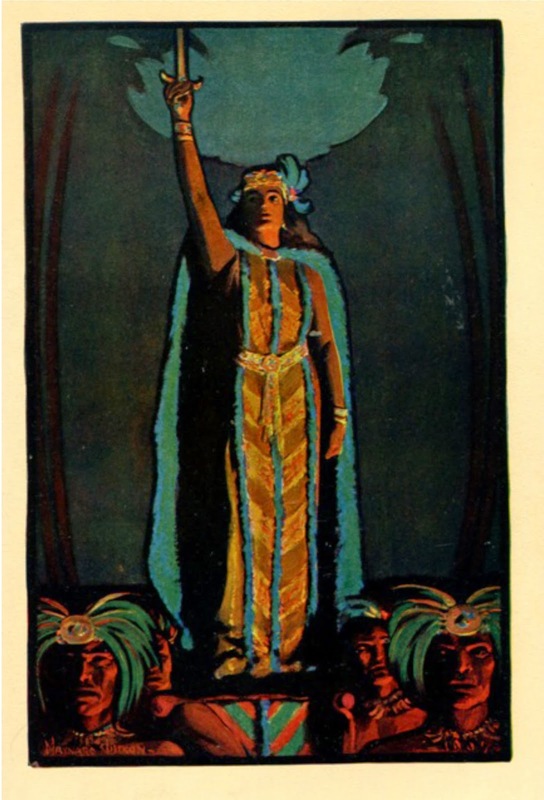 W.C. Morrow died on April 3, 1923, in Ojai, California, a month after Weird Tales made its debut. He was sixty-eight years old. 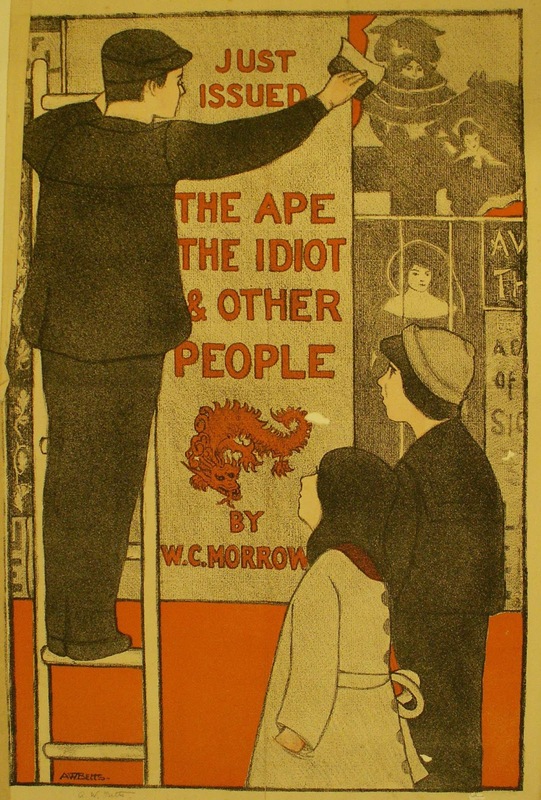 An advertisement for The Ape, The Idiot and Other People by W.C. Morrow (1897), created by Anna Whelan Betts (1873-1959). 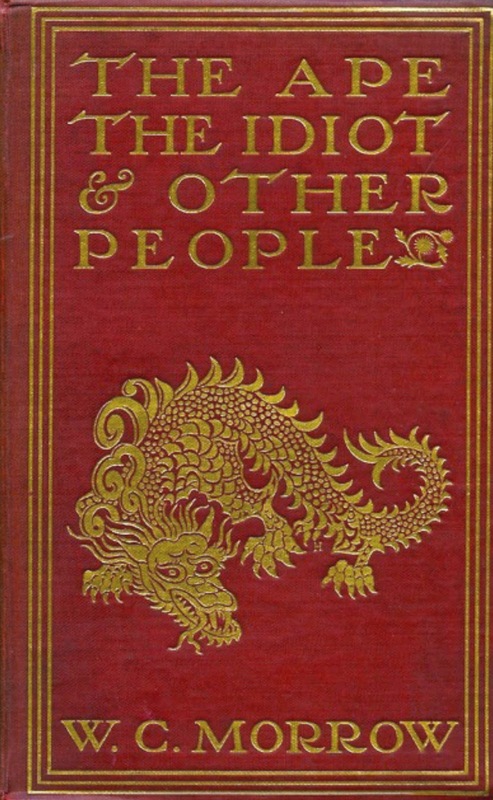 The Ape, the Idiot and Other People (1897). Image courtesy of John Lehner. 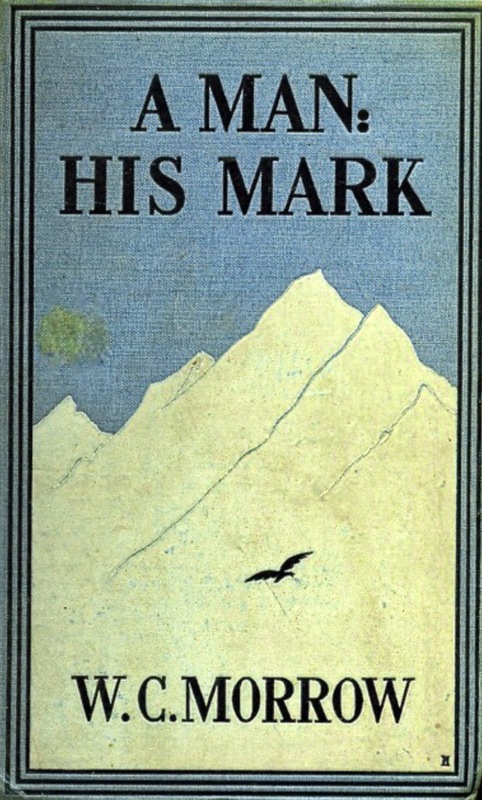 A Man; His Mark: A Romance (1900). Image courtesy of John Lehner. 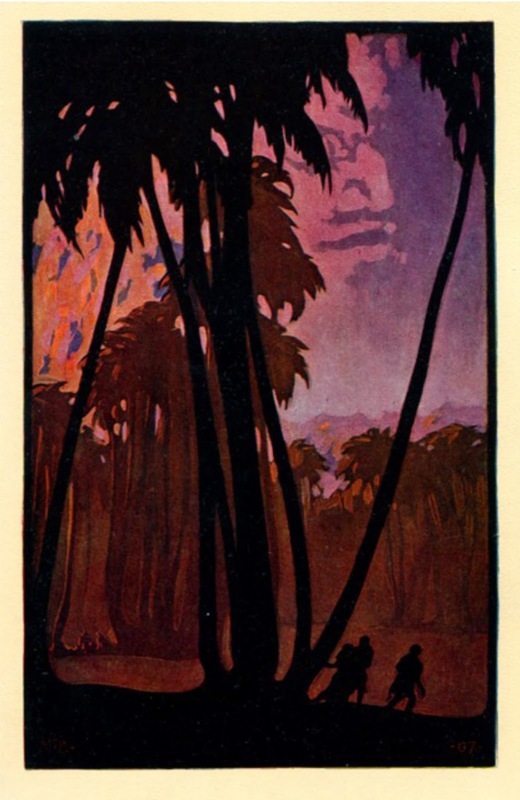 Lentala of the South Seas (1908), illustrated by the Western artist Maynard Dixon (1875-1946). Image courtesy of John Lehner. 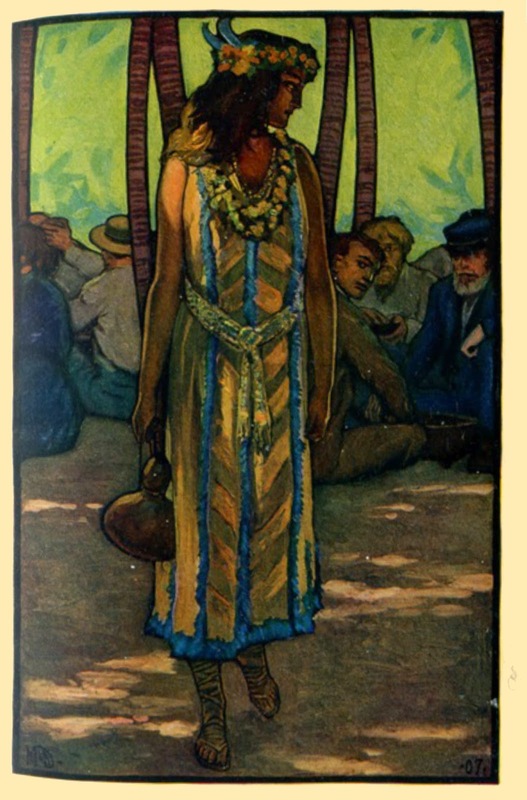 One of Dixon's interior illustrations for Lentala of the South Seas. Image courtesy of John Lehner. 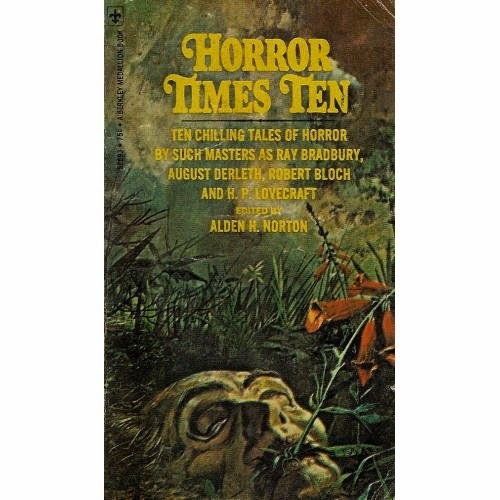 "His Unconquerable Enemy" appeared in the paperback collection Horror Times Ten, edited by Alden Norton (1967). Sam Moskowitz wrote that the story, "will never be forgotten by anyone who reads it." Note the similarity to the cover illustration of Horrors in Hiding from a couple of days ago. 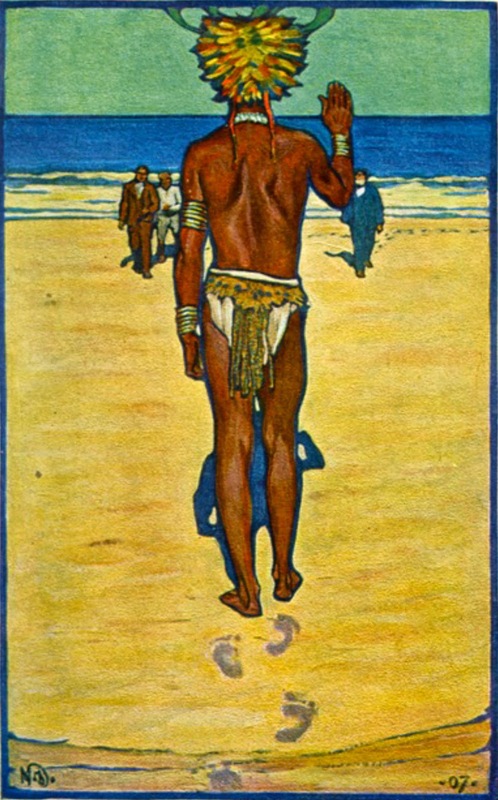 The remaining five illustrations by Maynard Dixon for Lentala of the South Seas by W.C. Morrow (1908), images provided by John Lehner. Update on January 24, 2015. Thank you, John. Thanks to John Lehner for images provided.